Wow, I really didn't mean to leave quite so long between blog posts, but as I'm sure some of you will agree, Christmas does funny things to a person. As I write, I sit here surrounded by sweetie wrappers, discarded presents and I am still basking in the light of the Christmas tree. However, with back-to-work looming on Wednesday, I feel like I'm slowly coming out of a Christmas fug. Don't get me wrong, I LOVED my Christmas fug. My little family had a fabulous time, and we've really enjoyed the last week of just doing things together all day every day. 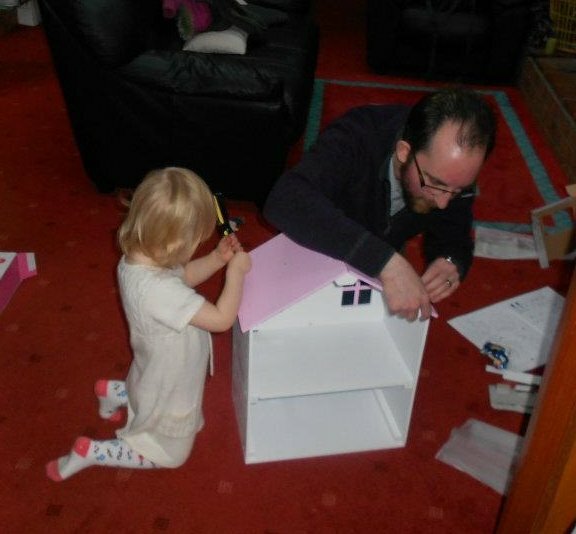 2 year old shows Daddy just how to build her new dolls house. 1. TAKE PHOTOS OF EVERYTHING! I am still so, so bad at this! For instance, I can't even show you today the two Christmas presents I sewed for family members. Possibly because I was desperately finishing them off, swearing at my machine at 11 o'clock on the evening of the 23rd, but mostly because I them wrapped them and dropped them off, without taking any photos! This has been my big bug-bear of 2011, and for 2012 I plan to take photos ALL THE TIME of what I do, and broaden it to include inspiration etc. I won't always have my camera with me, but my smartphone takes decent photos that would do, so I really have no excuse. Look! Exciting Chrimbo pressie inspiration! Take a photo and Blog about it! Ooooh I can't wait to try needle felting! 2. Post more regularly. I haven't quite finished my first year of blogging, and although I did attempt to blog every week, I didn't manage it. I have learned SO much though, and the blogging world is SO supportive, that I'm getting the hang of preparing topics and posts in advance, and learning that not every post needs to be an essay (like this one...ooops!). I Just need to keep tabs on those creative works or even thoughts or inspiration and post about it. I love reading those sorts of posts, so I hope you will love reading them here too. 3. Develop my little business. I'm really still just making because I want to, because I feel driven to create; so any money I make on the side selling things I've made I still very much consider a bonus. However, I would like to slowly work towards developing the business side of what I do. Firstly, that Folksy shop. I WILL get that set up in January! Then I plan to develop some embroidery patterns pdf's and also look into some other areas I've been researching. I've learned that I need to be quite realistic here. I already have a job and a family and other hobbies. I have often felt very frustrated by how little I've been able to achieve due to other demands on my time, but this year I will take it slow and steady. I intend to write a little planning document for myself, setting realistic targets to work towards and also...ENJOY IT!!! 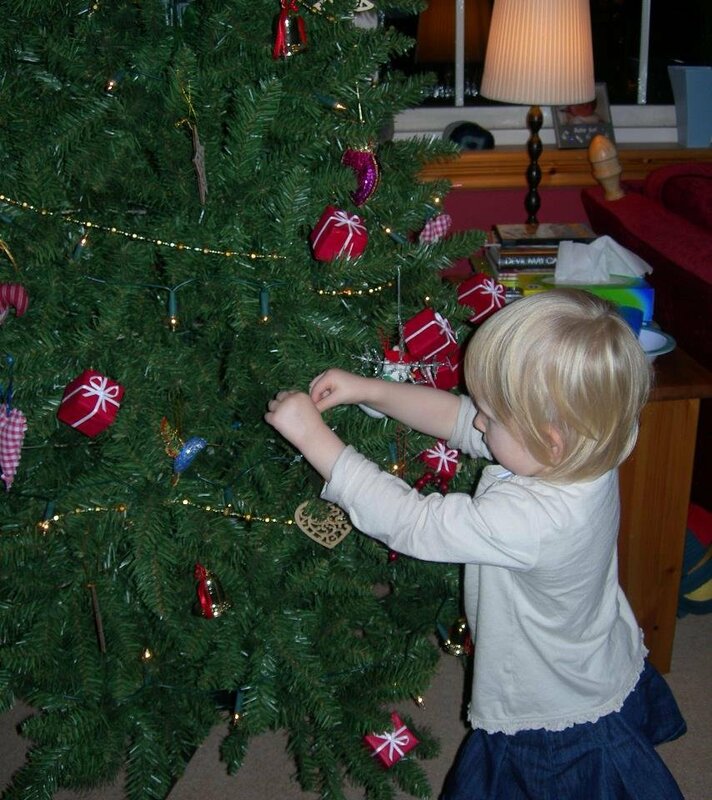 I love sewing and I love being part of this crafty online world! 4. Let inspiration flow. Since I started getting a little bit more serious about my sewing, my head has been practically BURSTING with inspiration, ideas, patterns...so many things! This year I will document these as best as I can, and fit them into my schedule where possible. My sewing cannot possibly keep up with my brain, but at least if I write it down, I won't feel like potentially great ideas are getting lost. Oh and I need to carry a little notebook or my phone with me everywhere. You never know when an idea will strike! 5. Network more. I am slowly learning that the area in which I live is actually quite arty and crafty! There are loads of groups, craft fairs and courses all around me! I hope to explore these a little more, and bit by bit (fitting in with my schedule) make more links, learn more techniques and improve what I do. For some reason I love the idea of sitting have a tea/coffee with a bunch of funky crafters and having a good old natter! Oh and with cake of course...you can't have tea and chat without cake! 6. Be more useful. This might sound like an odd one, but one of the reasons I got into blogging, and one of the reasons I want to network more, is that I want to contribute to the global craftsphere, and help in some way. My skills are very basic, and they are currently no match for my ideas, but I feel that everyone can contribute in some way, and I'm keen to do more myself. That might mean providing some free patterns or downloadables here on my blog, passing on my paltry skills locally or just joining in with local, national or global debate. However small, I want to do it. I've gained so much from all you out there already, that I want to start giving back. So, a few things to work on, but hopefully 2012 will be a year of inspiration, excitement and inspiration, and little or no frustration. Lastly, I would just like to say a big thank you to all those who have followed me and read my little newbie blog this year. You have all contributed SO much to keeping me going, and keeping me inspired! I hope you all achieve what you set out to do in 2012! Love reading your blog and wish you luck with your goals. Can't wait to see your posts. These are brilliant resolutions - good luck with them all! Brilliant set of resolutions there, looking to seeing what you get up to this year.